Among the most ancient of all insects, the cockroach has always pestered mankind. It is a loathsome, repulsive despoiler of our food and spreader of filth and disease. It is prolific, tenacious and hard to kill. There are many thousands of known species of cockroaches but the main pest varieties, which have adapted to infesting our homes, restaurants, shops, factories and offices, is limited to six species. These species enter our premises through doors, windows etc. and also in food cartons and packing cases which may contain eggs or adult cockroaches. They prefer the warmer areas in kitchens, around the hot water service, behind stoves, refrigerators, and dishwashers and in electric motors. At night they emerge to search for food and water. They are quite indiscriminate in their habits and enjoy feeding on garbage and sewage and then crawling over food, cooking utensils, plates etc. 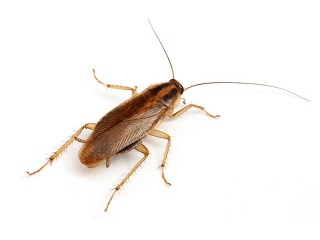 Cockroaches are known to harbour a wide variety of disease organisms, which can cause urinary tract infections, boils, abscesses, intestine infections, gastroenteritis, food poisoning, and diarrhoea. Successful cockroach control requires the identification of the species, the location of all harbourage areas and the correct application of modern control agents by a trained specialist. Our Technician has this knowledge and experience backed by a unique arsenal of cockroach control weapons. Crack and crevice spray to all external infested areas. Spray areas adjacent to infected area with low hazard water-based control agents. Dusting of cracks and crevices, cavities and service ducting, with a long lasting low hazard control agent. Power dusting of roof voids. Power dusting of wall cavities. Apply cockroach gel to cupboards and other internal infested areas. Dusting of appliances and electric motors. Space spray misting of roof voids. Space spray misting of wall cavities. Space spray misting of underfloor areas. Residual power spray of subfloor areas. Treatment of drains, septics, grease traps and rubbish disposal areas. Regular maintenance control service including preventive treatment and free treatment of any reinfestation within the service warranty period.